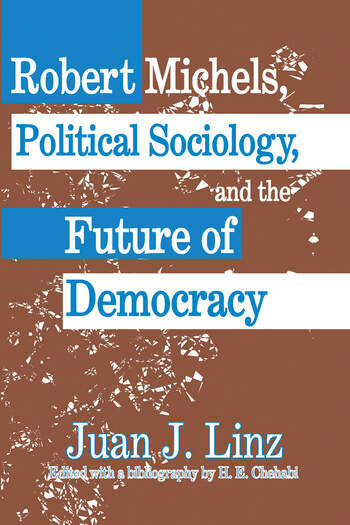 These essays by the brilliant historian of political science Juan Linz comprise a remarkable intellectual review of the life and work of Robert Michels, his major book Political Parties, and the dimensions of democracy as a functioning system. Linz elucidates the importance of Michels in a way that offers more than a mechanical view of political parties as some sort of precisely ordered system of authority and influence. Instead, Michels offers a view of politics that is bottom up and untidy, what he calls a "reciprocal deference structure." Michels is not simply the father of the iron law of oligarchy, but the idea of politics as a less than orderly network of responsiveness, responsibility, and accountability. Linz demonstrates, with magisterial power, why Michels must be ranked as a foremost thinker in classical political sociology. The remaining three segments of the volume cover areas with which Linz has also long been identified. Each in its own way illumines aspects of Michels as well. "Time and Regime Change" articulates differences between change within a regime and change of a regime--sometimes hard to identify because of the elongated time frames involved. The next essay explains why Spain is neither a traditional society nor a successful modern nation. The reliance upon central authority displaced the hoped for evolution of a society based on representative democratic institutions. The final section. "Freedom and Autonomy of Intellectuals and Artists" is a topic that gripped Michels and Linz alike. Freedom as a goal of the intelligentsia has been frustrated by those who provide ideological justification for repression of ideas and actions in the name of higher values. This segment provides a bridge between Michels and Weber--not to mention both of these major figures with Linz himself. The role of state power in mediating intellectual freedom is the leitmotif that blankets the twentieth century. The work is graced by a full-length bibliography of the writings of Juan J. Linz, prepared by his student and colleague, H. E. Chehabi.